Cynthia Childs Barlow Foote (1798-1877) and several of her children are buried in this family lot. Headstones also found here include Oscar W. Foote (1828-1850), Anna Maria Foote (1830-1832), Winthrop A. Foote (1832-1910), Isis Foote (1835-1851), and daughter-in-law Juliette (Curtis) Foote (1837-1901). Cynthia's husband is known as the father of the limestone industry in Bedford. A graduate of law and medicine, he left Connecticut to seek his fortune in the west. 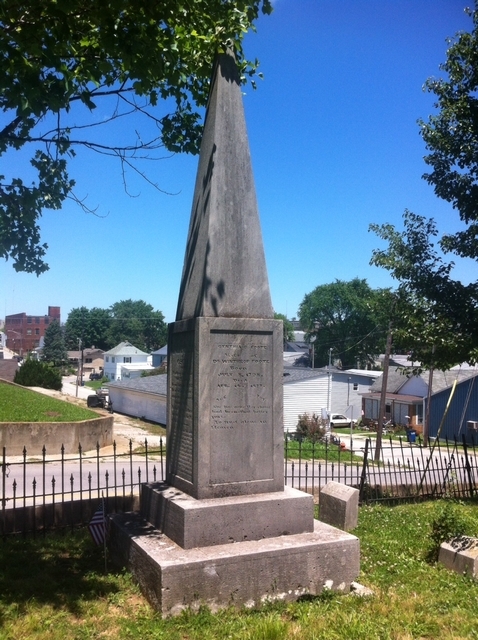 Dr. Winthrop Foote arrived in Palestine, Indiana in 1816. He married Cynthia in 1823. On the removal of the county seat from Palestine, the family moved to Bedford, where Dr. Foote engaged in legal pursuits and was elected State's Attorney. Preferring the practice of medicine to that of law, he returned to Bedford and resumed practicing medicine and engaged in development of local industry. Dr. Foote predicted that local limestone would be shipped to New York as a building material. This prediction, when there was no railroad or prospect of one in this part of the country, was remarkable. Foote is not buried in Green Hill Cemetery. He is buried beside his brother at Foote's Tomb, a private location east of Bedford near Blue Hole Quarry.